Once you have successfully changed your password, it is important to update any device (tablet, cellphone,) and any client software like Microsoft Outlook to your new password. Failing to do so will cause the device/software to try logging in using the old password multiple times and the account will be locked as a security measure. How do I configure OCAD U wifi to my device? Faculty & Staff: How do I setup OCAD U email on my Apple device? Faculty & Staff: How do I setup OCAD U email on my Android device? 1. Go to the sign in page in the OCAD U Portal (for quick access click here.) Do not fill in the fields provided. Simply click "Change Password" in blue just underneath "Login"
2. Fill in the fields provided as directed and check the square next to "I'm not a robot"
3. Check the images that match the command and click verify. If it doesn't work, click reCAPTCHA and try again. 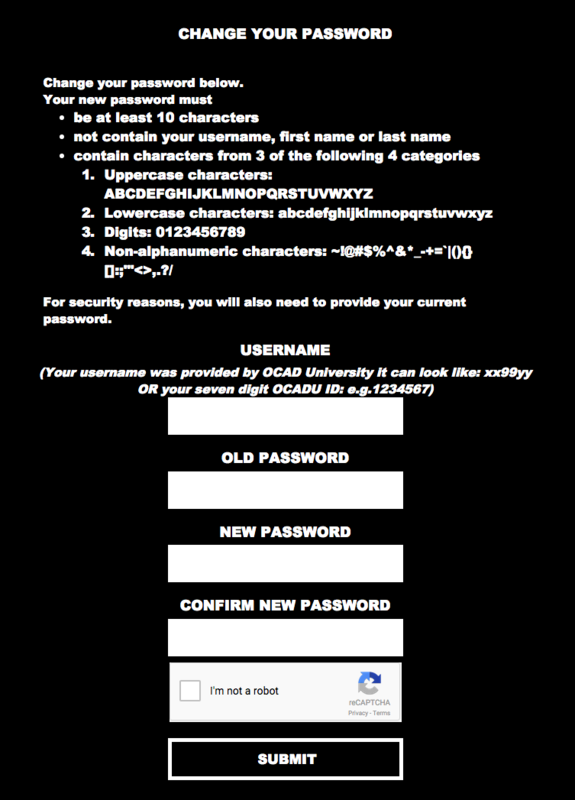 Then click "Submit"
You have now successfully changed your OCAD U password. 1. Go to the sign in page in the OCAD U Portal (for quick access click here.) Do not fill in the fields provided. Simply click "Forgot Password" in blue underneath "Login"
2. Fill in your OCAD U username and click "Next." 3. Select an email address that you have access to from the list and click "Next." The email addresses are partially obscured in the interest of security. 4. You will now be told that an email has been sent and how much time you have to reset your password. 5. Check the email address that you selected above for an email from passwordreset@ocadu.ca with a link which takes you back to the application to complete the final step. 6. You will be presented with a form allowing you to select a new password and a captcha. Ensure the new password conforms to the complexity requirements. 7. 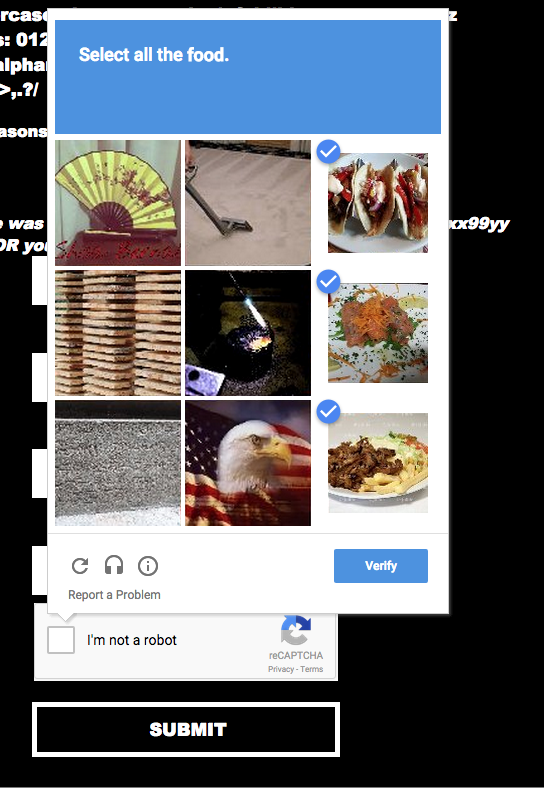 Now check "I am not a robot" and select the images that match the command and click verify. If it doesn't work, click reCAPTCHA and try again. Then click "Submit"
You have now successfully reset your OCAD U password. 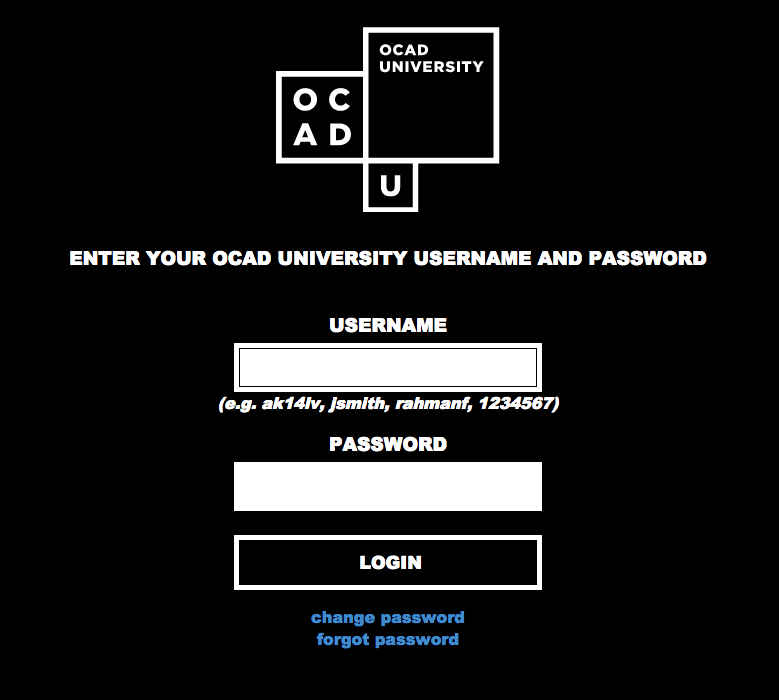 Q. I've reset my password but can't access my OCAD U Student Email, what do I do? A. Browse to my.ocadu.ca and reset your password based on the instructions above. If you change you password any other way than what is laid out above, you may experience issues. Q: I've reset my password but now I can't access wifi on my device, what do I do? A: You will need to go into your network settings and update you password. If you are unsure how to get there, this article can help.